In this photo, I'm standing on the Komagata-bashi, looking upstream at the Azuma-bashi and the Tobu Railway Bridge. 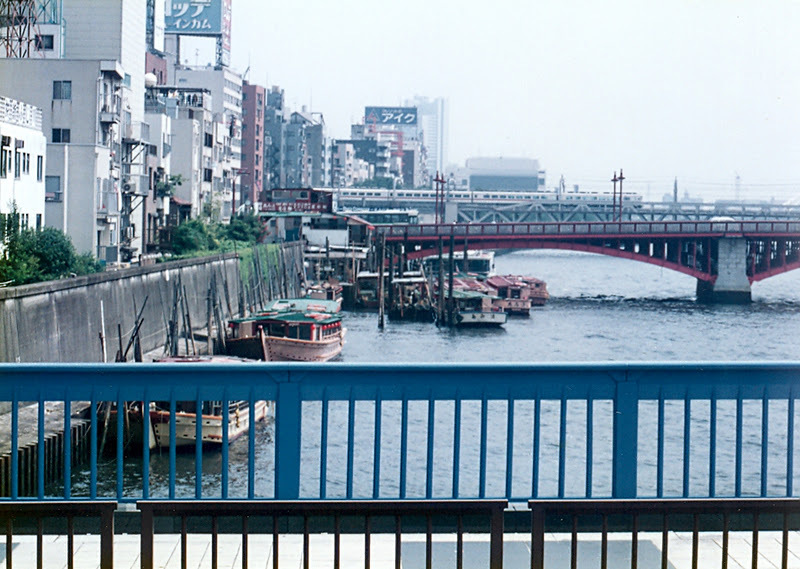 The Azuma-bashi was built in 1931 and replaced a timber bridge built in 1774 that was occasionally depicted in ukiyo-e prints (usually in the distance). The current bridge is a three-span, open spandrel deck arch. Note the railings, lamp posts, and arch ribs are all painted bright red. The steel arches are supported by massive stone masonry piers. The bridge is very wide with broad sidewalks and vehicle lanes. The bridge also has very limited vertical clearance and signs warning ships to slow down. Tokyo's River Crossings: Azuma Bridge (1) by Mark Yashinsky is licensed under a Creative Commons Attribution-NonCommercial-ShareAlike 3.0 United States License.